Recover deleted or corrupt emails from thunderbird , can recover deleted items even if they have been cleared from the deleted items folder . scans the local disks for recoverable files , simple to use interface. Keywork filter allows you to filter large amount of results down to a more managable amount and the header sorting allows to group email header items such as from to and subject. You can try Advanced Thunderbird Email Recovery. 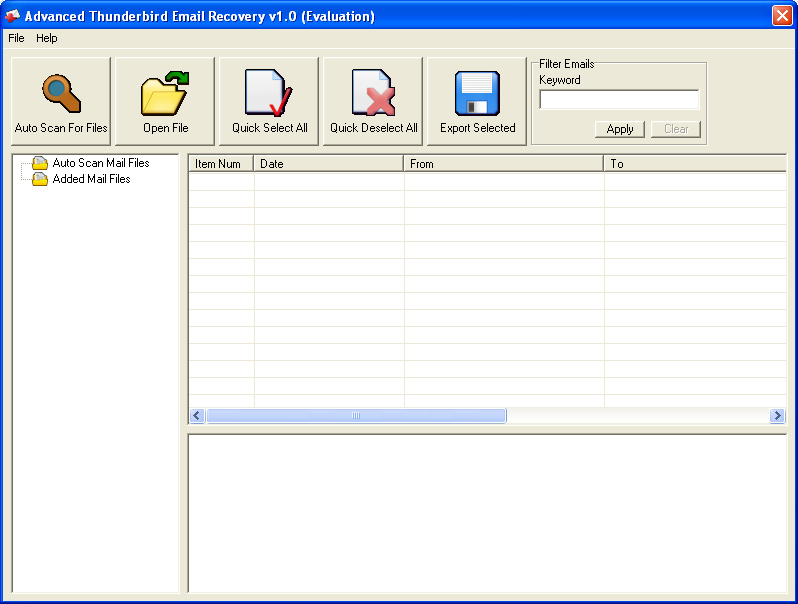 Recover deleted or corrupt emails from thunderbird mail client. ...... be opened by all major email clients) . Qweas is providing links to Advanced Thunderbird EMail Recovery 5.0 as a courtesy, and makes no representations regarding Advanced Thunderbird EMail Recovery or any other applications or any information related thereto. Any questions, complaints or claims regarding this application Advanced Thunderbird EMail Recovery 5.0 must be directed to the appropriate software vendor. You may click the publisher link of Advanced Thunderbird EMail Recovery on the top of this page to get more details about the vendor.